Gold and Silver are Looking Bullish. How Long will This Rally Last? Coming up we’ll hear from David Morgan of the The Morgan Report to get his take on the advance in the metals so far this year, how long it’s likely to continue, and whether or not the Silver Guru is concerned that silver is lagging gold during this rally. 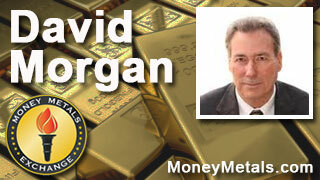 Don’t miss a fantastic interview with David Morgan coming up after this week’s market update. Well, as investors await a Federal Reserve policy decision next week, this week European central bankers stole the spotlight by hitting the panic button. The Bank of England announced emergency measures to flood banks with billions of pounds of cash ahead of the June “Brexit” vote on withdrawing from the European Union. And on Thursday, the European Central Bank rolled out massive new stimulus measures in a desperate effort to revive economic growth. Here in America, Republican Party operatives have entered panic mode over the likely nominee’s seemingly unstoppable momentum. As Donald Trump’s lead grows so does the sense of panic among establishment Republicans. What are their real options though? Many establishment Republicans who backed Jeb Bush or Marco Rubio or John Kasich have now reluctantly concluded that Ted Cruz is the only man left standing who can stop Trump. If Cruz does somehow get the GOP nomination, he would be first major party candidate in decades to champion fundamental monetary reform, including a return to a gold-backed dollar. Speaking of gold, the yellow metal got a boost on Thursday from the European Central Bank announcement. The ECB dropped interest rates a tenth of a point further into negative territory and expanded its Quantitative Easing program. The U.S. dollar initially rose on the news, but then fell sharply against the euro after ECB chief Mario Draghi said no additional stimulus measures are in the works. The U.S. Dollar Index finished Thursday down more than 1%, helping to propel gold prices higher by 1.5% on the day. As of this Friday recording, gold is giving back a good portion of those Thursday gains and trades at $1,257 an ounce, now essentially flat for the week. Silver prices come in at $15.58 an ounce and are also unchanged week over week with a just few hours left before the Friday close. Turning to the platinum group metals, platinum is down 0.9% this week to trade at $972 per ounce, while palladium shows a gain of 3.9% to trade at $580. The follow through this week for palladium, which was up huge last week, now means the industrial metal is in positive territory for the year, finally, along with platinum, silver, and gold. Looking ahead to next week, the Federal Open Market Committee meets Tuesday and Wednesday. The Fed is widely expected to keep rates unchanged. But, as always, traders will be ready to react to the language contained in (or absent from) the Fed’s statement. Barring an unexpectedly hawkish statement from the Fed, it appears as though the path of least resistance for the U.S. dollar is down. The Dollar Index made a high in late November just above the 100 level. Since then, it has experienced two sharp declines followed by two failed rallies. A third sharp decline to lower lows may now be underway. Of course, on a fundamental basis it makes little sense to be bullish on the dollar’s major counterpart, the euro, with negative interest rates in force. The reality is that there are no fundamentally sound fiat currencies left in the world. The more central banks that try schemes like negative interest rates, the more attractive physical precious metals become as alternative currencies. I’ll ask my podcast guest this week, David Morgan, for his thoughts on the likelihood that we’ll see negative interest rates here in the U.S. coming up in just a moment. It’s not difficult to do the math. A gold coin that yields 0% offers investors a better return than a bank deposit or a bond that has a negative interest rate attached to it. Yet as of today, around $6 trillion in global wealth is parked in negative-yielding instruments. It makes no logical sense that people would invest in a guaranteed loser unless they fear losing even more in other types of assets. Precious metals were in a bear market from mid 2011 through 2015. But this year the gold market has broken out into bull market territory with gains of close to 20% from the lows of last December. If the bullish momentum continues – and especially if silver starts joining the party in a more dramatic way – then more people could be enticed into precious metals. In a virtuous circle, rising prices stimulate more demand, which in turn fuels higher prices. People who are currently stuck in low-yielding, no-yielding, and negative-yielding bond instruments have to realize that hiding out in something that is sure to lose value over time is not a prudent investing strategy. Yes, the precious metals markets can be volatile. Yes, gold and silver spot prices can go down on any given day. But at the end of the day, gold and silver offer superior long-term inflation protection and far greater upside potential than dollars, euros, or any other fiat currencies. Mike Gleason: I'm happy to welcome back our good friend David Morgan of TheMorganReport.com and author of the book The Silver Manifesto. David it's a pleasure to talk to you as always, how are you? David Morgan: I'm doing well, thank you for having me on your show. Mike Gleason: Well to start out I'll ask you to comment on the market action here in 2016 so far. Now, gold and silver have done quite well, we had gold advancing on weakness and concerns in the equities markets earlier in the year. Now over the last week we've seen it continue to do well even as stocks rebounded after a strong employment report. One would think it's a bullish sign when we get good price action even with supposedly negative news for precious metals coming out. So give us your thoughts on the market action so far this year, David, and specifically why do you think the metals have done so well here in the early part of 2016? That's basically it. I think it's pretty simple. I don't think you need to look much further than that. I would add on another real key element to knowing that things are finally off the bottom and going to continue, backing and filling, up and down – but nonetheless, the bottom is in – is the volume. The volume is substantial. The amount of flows into the gold ETF is the greatest that it has been since 2009, which is after the 2008 crisis but the first one that was off the bottom were the precious metals. Mike Gleason: That leads me right into my next question. We do have gold outperforming silver so far this year, which generally we don't see when the metals as a whole are rising. That means that the gold to silver ratio has actually even gotten a bit higher, sitting at about 82 to 1 as we're talking here on Thursday. Are you concerned that silver is lagging gold a little bit? David Morgan: I am concerned. I believe that we have a non-confirmation. I like to see that the whites the yellow or vice versa and that non-confirmation does concern me. I think that we want to see silver over $16 and then things will proceed upward, probably even more than they have so far. In other words, silver will either play catch up or it won’t. If it doesn't, it doesn't mean gold won’t continue (going up). What it does mean is that there might be some more work to be done. So I have a different view, Mike, I think they're going to stay the same or even perhaps increase again. I’m a very very lone wolf on this. I don't know many people that are saying what I just said, but that's my view. So if there were a stand-for-delivery mechanism, which exists, AND it was above and beyond what the physical amount of gold in the CME is, there would be paper settlement. And I'm sure that the mainstream press would probably spin it to where they would make it sound as positive as possible, something along the lines of, "Rogue trader stands for delivery, contracts settled by law with the price.” And they won’t say paper price. And “how dare they stand for delivery when everybody knows that a gold contract is just a paper mechanism to set the price and nothing to do with the physical demand.” Which of course is true and false. David Morgan: A great refresher for everyone, yes I think we'll have a good year but not a great year. I think the reason being is what I outlined. The biggest push for gold is a negative equity market. It's certainly in the cards. If you look at the rollover, the moving averages, the chart pattern, everything that I know after years is the fact that the stock market looks as if it's peaked here. And if that's true, then you're going to see more and more come into the gold market. Plus we have such a big start with the gold market, best in 35 years and volume. In other words, more and more are coming in the gold sector, which is primarily the large money which primarily invest in gold through the paper system meaning the ETFs. David Morgan: Absolutely. I would like to suggest to everyone that we have, in fact, me, I basically did it all on my own this time although I've got talent fairly deep, a new report called "Riches in Resources." And the "Riches in Resources" report is like eleven pages long and it will provide good information to you about the big picture on down, which means you're going to learn from the beginning about what happens at the end of the age of empire and what the progression is to a state of empire and then it moves from there down into the resource sector, then into the gold and silver story, the dollar story, the debt problem, and then it moves forward into the mining sector and what we do here at The Morgan Report. It gives you opportunities to make money in this market, not only through a subscription on The Morgan Report as a website member, but also we just give you some freebies on how you can make money in that report. Just a very, very easy situations if you are inclined to purchase gold and silver. And check back next Friday for a next Weekly Market Wrap Podcast. Until then, this has been Mike Gleason with Money Metals Exchange. Thanks for listening, and have a great weekend everybody.